Founded in 1968, our objective is to unite persons interested in antiques and collectibles in the Ottawa area, to promote the preservation of our historical heritage through the conservation of objects and data, and to encourage education in areas pertaining to antiques and collectibles. Open to anyone interested in antiques and collectibles. Start at 8:00 pm sharp, 1st Thursday of every month except January, July and August. Meetings are held on a rotating basis at member's homes. Guests are always welcome to attend meetings. Annual show and sale, Nepean Sportsplex, Sunday 25 April 2010! For dealers wishing to download a copy of our show contract, please go here. If you need flyers for the show here is one to copy. June barbecue - 'photo' of Club members at this summer's BBQ ! Note the bottles on the table. 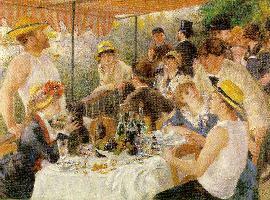 Many thanks to Pierre-Auguste (Renoir) for the image. The Bytown Bottle Seekers Club is a former member of the FOHBC . For more information please email our club president Jon Church.